The TABER® Scuffing Head Attachment enables you to perform scuff, scrape and/or adhesion tests with the Taber Rotary Platform Abraser. The range of materials includes vinyl, coated fabrics, leather, textiles, non-woven materials, fiberboard, rubber floor mats, carpets, plastics and painted products (including soft coating paint and pad printing on plastic substrates). A bracket is attached to the Taber Rotary Platform Abraser. Mounted to the inside riser mount of the left abraser arm, the scuffing head is held at a 100° angle to the specimen turntable platform. The vertical centerline of the scuff head is positioned 32 mm from the specimen turntable platform center pin, and is centered under a weight (0.45kg or 0.9kg) in a horizontal alignment with the center pin. 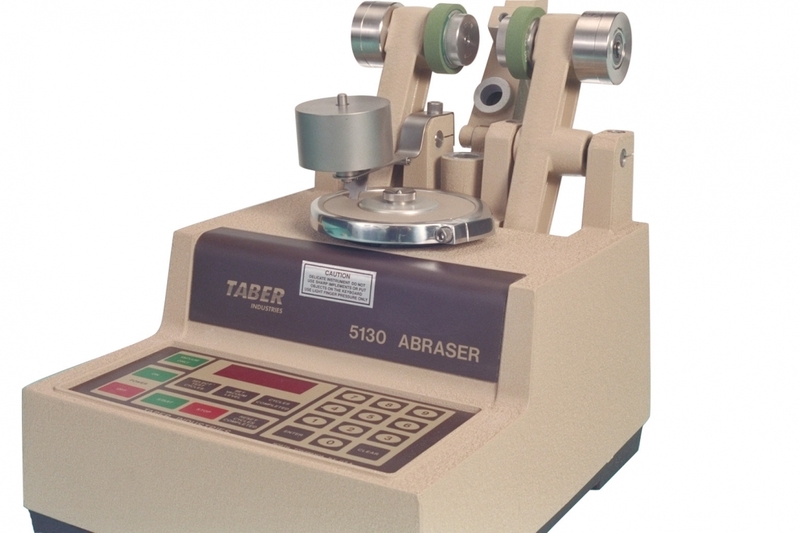 The Taber Abraser is operated in the normal fashion however the abraser arms are stored in the upright position and the vacuum system is not utilized. As the specimen turntable platform rotates, the scuffing head is dragged over the specimen surface. With a hinged design, the scuffing tool may be raised when not in use. Three unique profile scuffing head configurations are available. Scuffing head type "A" is similar to the flat blade of a screwdriver (blade is approximately 8 mm wide). Type "B" has a knife edge (blade is approximately 4 mm wide), and type "C" has a radius edge (blade is approximately 8 mm wide). Sold in kits, Scuffing Attachment Model 503-13 satisfies Ford Test Method BN 108-04 and SAE J365, and includes "A" and "B" scuffing heads along with a 0.9kg weight. Scuffing Attachment Model 304-GM (503-13-1) satisfies General Motors Test Method GM9911P and includes "C" head and a 0.45kg weight. The criteria for evaluating Taber Scuffing Head tests are dependent on the material being tested. Ford Motor Company specifies what is acceptable or unacceptable in each of their Engineering Specifications that require this test. For example, there shall be no evidence of lifting, peeling, excessive scuffing or excessive surface deterioration. When testing painted parts for General Motors it is typically unsatisfactory to have any removal of paint. 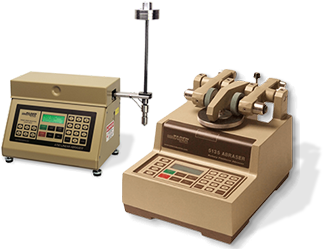 The following link provides a listing of test methods the Taber Abraser (Abrader) and Scuffing Head Attachment satisfies. Please note, additional accessories may be required.